Snack O’Clock and the science behind it! Nutritionists say dieters should opt out of drinks rounds at work because they put themselves under peer-group pressure to consume unnecessary calories with colleagues. The results are revealed in a new survey of 1,000 people by diet firm Forza Supplements. The research demonstrated that there are three specific times in the day when we’re likely to throw out the healthy eating rule book: 11:01am, 3.41pm and 9:31pm. As much as 750 calories are consumed at these times of the day – enough to ruin even the strictest diet plan. The findings point to key mistakes that dieters make. These include skipping breakfast (leading to making poor nutritional choices for an elevenses snack), tackling post-lunch stress with food, and succumbing to temptation late at night. The report also highlighted the high calorie count of an average coffee shop latte (190 calories). While there’s nothing wrong with snacking to keep energy levels up during the day, the study is useful in pointing out when we might make bad food decisions. Remember: preparation is key when sticking to a healthy eating plan. Be inspired by our round-up of nutritious snack ideas, instead. Giving Tree snacks are here to help, the perfect snacks to try during your day are our 7 different varieties of fruit and veg crisps. When reaching for a chocolate bar, packet of crisps or cheese and crackers we have the perfect alternatives for those both sweet and savoury cravings! Why not try our vegetable crisps dipped in reduced fat humous, tzatziki or guacamole or just as good on their own! Our fruit crisps (apple, peach ,strawberry and mango) all make fantastic toppings for a bowl of natural yogurt or ontop of some fat free coconut yogurt..we love cofro! 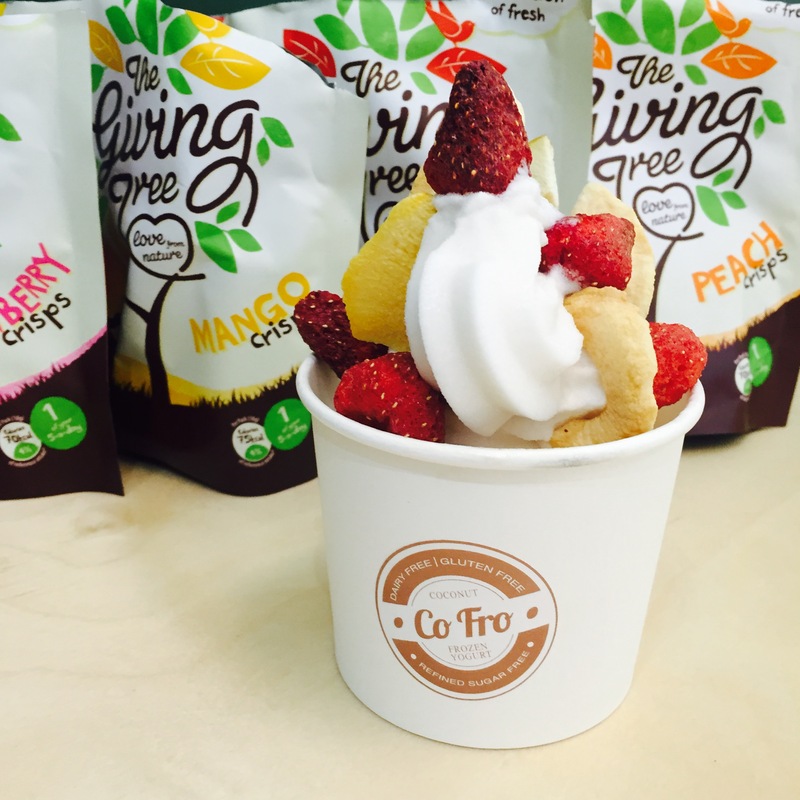 Take a look at the mouth-watering picture above, this was a fat-free, dairy free, gluten and refined sugar free coconut frozen yogurt with our yummy Giving Tree fruit crisps on top mmm! Let us know your favourite healthy snacks and how’ve incorporated Giving Tree into your healthy snacking!